If you’re watching your backyard feeders, you may notice the Eastern Goldfinch’s feathers may look ruffled. It’s an exciting sign that New Jersey’s birds are molting and soon the bird’s bright yellow feathers and songs will announce spring’s arrival. In New Jersey, the Neotropical Migrant Songbirds make their way through the state in late April and early May. So if you’re looking forward to hiking the great outdoors to enjoy the change of season and its accompanying songbirds, let’s tune you in to the sounds of nature’s singers. When I was a child, I enjoyed my very first guided walk during a spring festival in Cape May led by the New Jersey Audubon Society (NJAS). I was amazed by the guide’s ability to quickly pick out and name the bouncing flock of birds that flew overhead by sound alone. Those flares of yellow dashed quickly out of sight, and, in an instant, the guide recognized NJ’s state bird – the Eastern Goldfinch. I was sure our guide had superhuman talent; I was amazed that anyone could identify a bird by song alone. Today, outdoor enthusiasts have all sorts of technology readily available to study bird calls and songs. With little practice, you too can develop and polish the skill of birding by ear. Like my guide, you can also make a superhuman impression on a kid, who like me, became fascinated with the skill. Listening to bird songs has great benefits that include increasing your mental productivity and making you more in tune with nature (and your outdoor neighbors). The strange and exotic sounds of these migrating birds are easier to identify as they differ from the birds, which make their home in New Jersey year-round. Many of these winged tourists including warblers and goldfinches just stop by your feeder for a bite to eat and continue their travels farther north to nest and raise their young. Birders across the state look forward to spring’s arrival and the warbler mania that ensues. So what tools do you need to learn the sounds of these visiting birds? Most smartphones have apps that help you learn bird songs. A few include ibird, Larkwire Birdsong Master Birder. You can also purchase a digital field guide like the Peterson Birds of North America and the Cornell University Macaulay Library has entire collections of digital MP3s for sale that can be downloaded to your computer. If you prefer to listen on your car stereo, birding CDs for purchase as your local book stores including the Peterson Field Guides Birding by Ear. If you’re a self-proclaimed audiophile fan like me, you can still use a record player. There’s a special quality about the way birds sound on my old-fashioned machine. With accompanying field guide in hand, you can listen and learn as you read descriptions and enjoy the artistic rendering of the birds in full color. 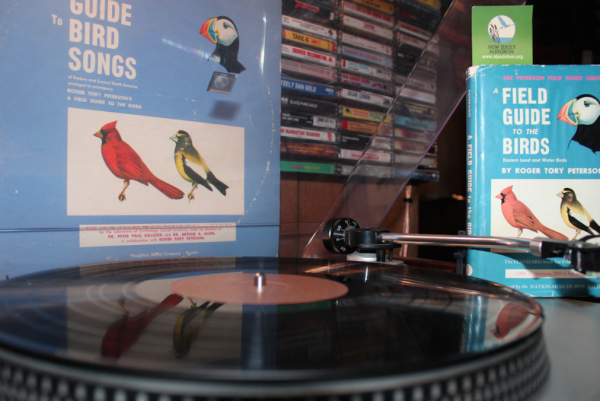 This post’s cover photo features a 1947 printing of a Field Guide to the Birds by Roger Tory Peterson and its aacompanying vinyl album from 1971, which was originally published in 1959. A Blue Jay’s tune hasn’t changed. It’s just the ways we tune out the world and tune in their’s that allow us to learn and appreciate birdsongs in any century.